Now you can make espressos, cappuccinos and lattes with ease, using your favorite ground coffee. This powerful 1050W machine comes in a small footprint to save counter space. Easy to use and reliable unit makes espressos and cappuccinos using the frothing attachment, as well provides hot water for brewing tea. There are many built in safely and convenience features, starting with the 15 bar operation of the boiler with comes with the overpressure safety valve, removable water reservoir and spill tank. 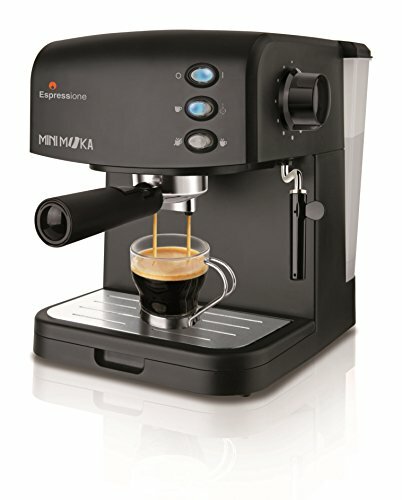 comes with 2 filter holders that work with a variety of coffee and allows you to make espressos and creamy cappuccinos with ease using the Extra Cream system, the dial knob on the side controls the frothing power. Elegant white cream color. If you have any questions about this product by Espressione, contact us by completing and submitting the form below. If you are looking for a specif part number, please include it with your message.